Above is Jessica Korda with Michelle Wie. And happy 20th birthday to Jessica - she was able to celebrate at this party. And yes, Korda is a little taller than Michelle in this pic. Blame it on the shoes. Congratulations to So Yeon Ryu. First, she was the 2011 U.S. Women's Open winner. 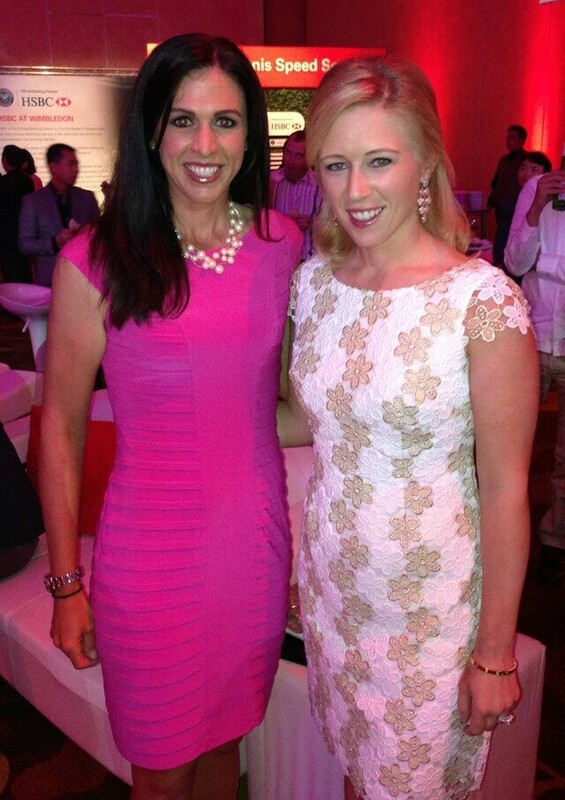 Then, she was the 2012 LPGA Tour Rookie of the Year. And now, she's a college graduate. So Yeon attended her graduation ceremony on Monday in Korea at Yonsei University, from which she now holds a degree in Sports Business. Ryu was a junior at the time of her U.S. Open victory, and has completed her studies since then while balancing life as a professional golfer. Yonsei is one of the oldest and most prestigious universities in Korea, located in Seoul. The wait is finally over - the 2013 Symetra Tour season tees off this week in Arizona at the VisitMesa.com Gateway Classic. And @bjohnston_golf!! RT @sarabrowngolf: First practice round of the season w/ @malblackwelder and @smhgolf WOOHOO! 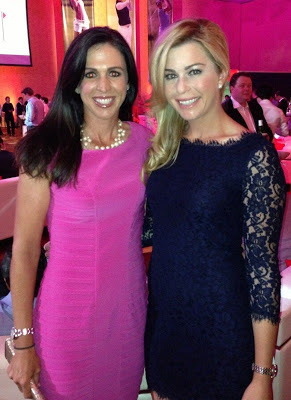 Best of luck to the Golf4Her girls, and to all our other friends on the Symetra Tour in 2013. Here is the 2013 Symetra Tour schedule. 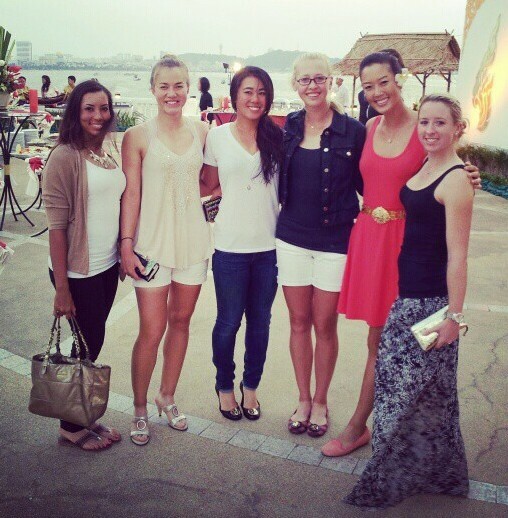 The LPGA is in Thailand this week for the 2013 Honda LPGA Thailand tournament. That means dressing up for dinners and posing in traditional Thai dresses. From left, that's Cheyenne Woods, Vicky Hurst, Danielle Kang, Jessica Korda, Michelle and the recently married Jodi Ewart (congrats Jodi!). Michelle, Ai Miyazato, Sandra and Paula Creamer. Who Wants to Play Golf with Blair O'Neal? That's a silly question, isn't it? 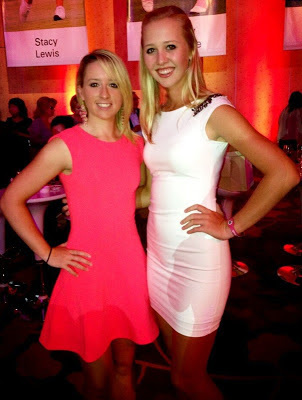 Who wouldn't want to play golf with Blair O'Neal? Thanks to Blair and Cobra Golf, you might have the chance - if you are lucky enough to win the sweepstakes. You might have seen the photo above of Blair (perhaps with a different color bikini) in the Sports Illustrated swimsuit issue, or in recent issues of Golf Digest or Golf Magazine. You can see even more photos of Blair from this photoshoot here. So what's this sweepstakes business? Blair is a member of Cobra Golf's Tour staff. And to help promote its new Cobra AMP Cell driver, Cobra is giving away a golf vacation to California that includes one of the new drivers plus - and this is the important part! - a round of golf with Blair. See the magazines for more info, or you can enter online here. Be sure to read the fine print, the most important of which is this: The sweepstakes closes on March 15, 2013. So get your entries in soon. Watch for Sharmila on the Ladies European Tour in 2013, where she'll be playing on the strength of her Top 30 finish at LET Q-School. And don't worry, the only thing about her that bites are her wedges into greens.